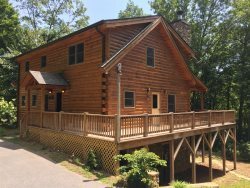 Great Smokys Cabin Rentals has a vacation cabin for everyone! Smithsonian Magazine named Bryson City one of "The 20 Best Small Towns to Visit in 2016". From big, upscale, luxury log cabins with spectacular mountain and lake views to charming fishing cabins, bring your family and friends to the beautiful Smoky Mountains. Check out our latest Smoky Mountain vacation packages and deals below! Your choice of the 7th night free for weekly stays or 10% off the nightly rate.